The annual black-tie optional gala celebrates regional business excellence, honoring outstanding professionals in nine categories for their contributions to the greater Knoxville economy. The 15th annual Pinnacle Business Awards, April 26, 2019 at the Knoxville Convention Center, celebrates 150 years of regional business excellence. 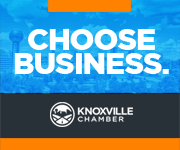 Winners are selected by the Knoxville Chamber Board of Directors. Applicants are nominated by the regional business community. This award is presented to an East Tennessee small business that has consistently grown its workforce and revenue. Nominees should not be a part of a regional, national or global franchise, should have started business in the Knoxville region, and have 50 employees or less company-wide. The winner will be able to demonstrate its ability to overcome obstacles including access to capital, operational efficiency, control of expenses, customer loyalty and distribution of products or services, and should provide a historical index of growth in revenues and workforce. Awarded to a non-franchisee company with 51-200 employees, headquartered in East Tennessee or a company with a significant presence in East Tennessee, that has shown remarkable profitability, growth and stability. Nominees must be recognized regionally, nationally and/or internationally in their respective business sector, while demonstrating leadership in the sector as well. Nominated companies should have made significant investments in facilities and employees. Awarded to a non-franchisee company with 201+ employees, headquartered in East Tennessee or a company with a significant presence in East Tennessee, that has shown remarkable profitability, growth and stability. Nominees must be recognized regionally, nationally and/or internationally in their respective business sector, while demonstrating leadership in the sector as well. Nominated companies should have made significant investments in facilities and employees. This award is presented to an East Tennessee non-charitable business that displays a commitment to making East Tennessee a better place to live through the development and support of a community project or program. The Impact Award winner should be able to demonstrate the ability to improve community conditions that make a significant contribution or impact on our region. Such contributions might include: improving education, improving healthcare, pursuing environmental excellence, performing community service, and influencing other organizations to partner for these purposes. This award is given to an East Tennessee business that has developed a new technology, innovative product or service or applied a business system or service in an innovative way. The winner will be able to quantify its growth and provide a detailed explanation of the new product, service or system. Nominee should provide a description of implementing innovative solutions to achieve operational efficiency and business results. This award is presented to an outstanding East Tennessee minority-owned business which is not part of a regional, national or global franchise, is independently-owned and operated, and controlled by ethnic minority group members. Minority group members are defined by the Small Business Administration as United States citizens who are Asian Indian American, Asian Pacific American, Black American, Hispanic American, or Native American. Ownership by ethnic minority individuals means the business is at least 51-percent owned by such individuals and the management and daily operations are controlled by those minority group members. This award is presented to an outstanding East Tennessee woman-owned business which is not part of a regional, national or global franchise, independently-owned and operated/controlled by a female or females. The enterprise must be at least 51-percent owned by one or more women and its management and daily business operations must be controlled by one or more women. This award is presented to a young professional, 40 years of age or younger as of April 26, 2019, who lives and works in East Tennessee and has achieved success while overcoming obstacles, to become one of tomorrow’s top business leaders. The winner will have started or is at risk in ownership in their non-franchisee business. They will have taken their business practices and moved a company from early growth to some maturity. This award is given to a longtime business leader that exhibits strength in character, resolve and a commitment to the community and exemplary success in the regional business community. Honorees are selected by the current Chairman of the Knoxville Chamber Board. Established in 2011, this award is presented periodically by the Knoxville Chamber to an individual who has exhibited a history of distinguished service to the Chamber. Winners of this award have dedicated tireless hours to helping ensure the organization is serving the business community appropriately and effectively.